g nappies – the easy reusable! We try to have a “green” household, recycling where we can and reducing our waste. There is one area of huge waste, nappies. When you consider that on average we do 6-8 nappy changes a day with a small baby in the house, there is an awful lot of waste going to landfill. We are using cloth nappies, but I find them muddly when we’re on a day out and so resort back to disposables. What if there was a greener disposable? A disposable which was biodegradable rather than one that sits festering for years waiting to break down? gnappies are nappies with a disposable liner which is biodegradeable – you can even compost the ones which are just wee soiled! Pretty impressive to think you could be throwing your baby’s wet nappy in with your carrot peelings and then using the compost which you create to grow some beautiful flowers! There will be lots of people reading who will say they don’t compost, or they can’t compost as they don’t have space, so I am planning to change your mind on this in the next post. Where I’ll demonstrate just how easy composting is, and how well the gnappies liners decompose! But for now, let me talk about what I think of the nappies – as let’s face it it’s all about keeping baby comfortable and dry! 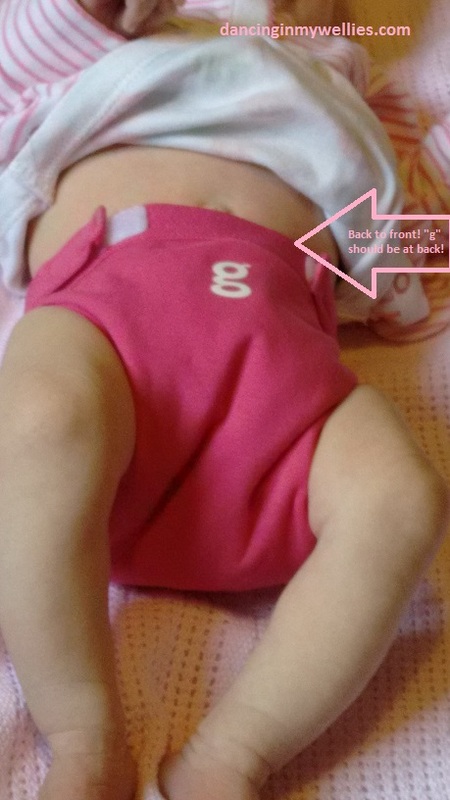 The nappy outers are fabulously soft, and easy to fasten with velcro. We did initially make the mistake of putting the nappy on back to front.. (the g is meant to be on the back!) but we were impressed that even though it was back to front it did not leak – hooray! Popping the liners into the gPants is really easy, and don’t panic – they look huge but they’re really not once they’re in the pants! Taking them out is equally easy and relatively mess free even when dealing with baby poo! SO, in theory you need one g pants each day and they liners, although I tend to find we use 2 pants each day. The pants wash well, and I like the fact that the bit holding the liner can be popped out for thorough machine washing! The pants stay soft after washing, and so far have washed really well and come up like new each time. 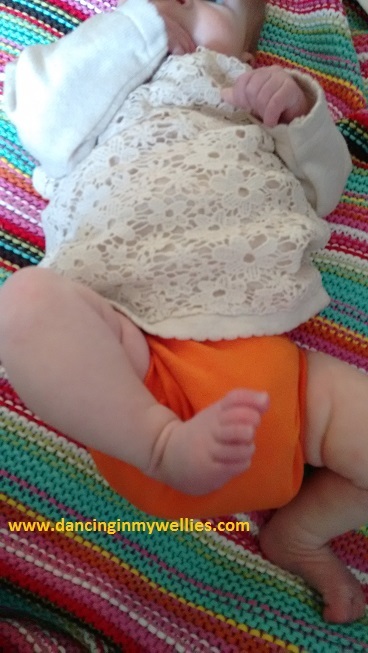 As Yo gets more mobile, I think it’s really important to assess how well nappies perform when she’s wriggling about, and I am pleased to say that due to the elastic around the legs, g nappies are both comfortable and leak proof on her even when she’s enjoying tummy time! g nappies – Yo approves! The cost, with initial outlay as roughly £14.99 each pair of pants, and then £8.99 for the liners you may think it is quite pricey, but when you compare the cost to a brand nappy suddenly the cost is actually rather competitive. I have to say, I think that g nappies feel a lot softer than lots of the big brand nappies too. I like the ease of g nappies, they’re ideal for people who want to be environmentally friendly without lots of washing and drying, and the ease of being able to grab a packet of liners from the supermarket shelf when you’re on a day out and have forgotten to pack yours.. (I *may* have done this..). So.. watch this space and I’ll share our composting #gnappies experience! In the mean time do pop over to say hello to g nappies on twitter for all the latest updates!